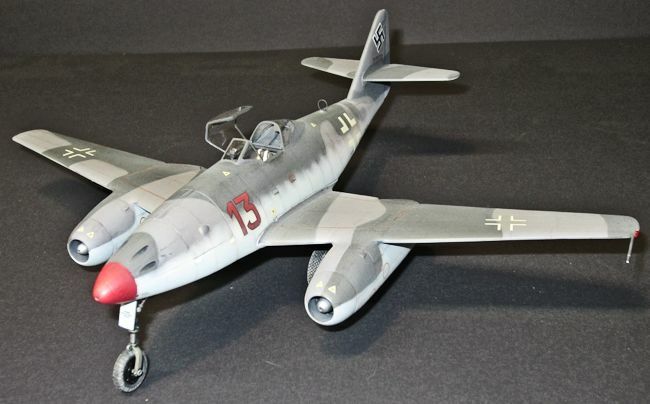 The Me 262 was the first jet fighter to see combat. Its development was started in 1939. The first jet powered flight was made on July 18, 1942. 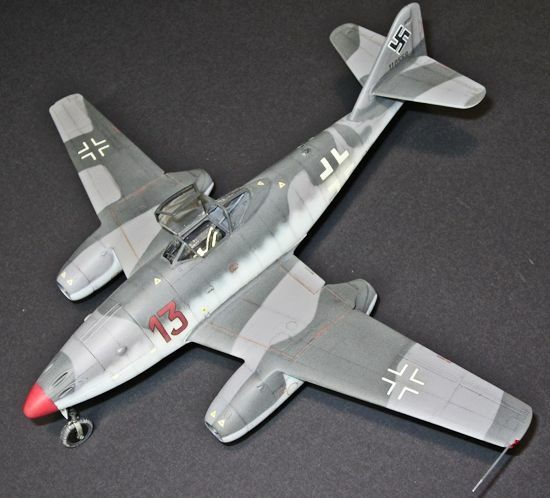 Delays in the fighter development were caused by Hitler’s insistence on the Me 262 being used as a bomber. These setbacks were minor compared to the slow development of reliable jet engines. More than any other factor, poor-performing, unreliable engines kept the Me 262 (and all other early jet fighters) from being a deciding factor in the outcome of WWII. Even with the engine problems, the Me 262 was an incredible performer. Its straight line speed (540 mph) and devastating firepower (four MK108 30mm cannons and R4M rockets) gave the Allied Command fits, and the “bomber boys” nightmares. 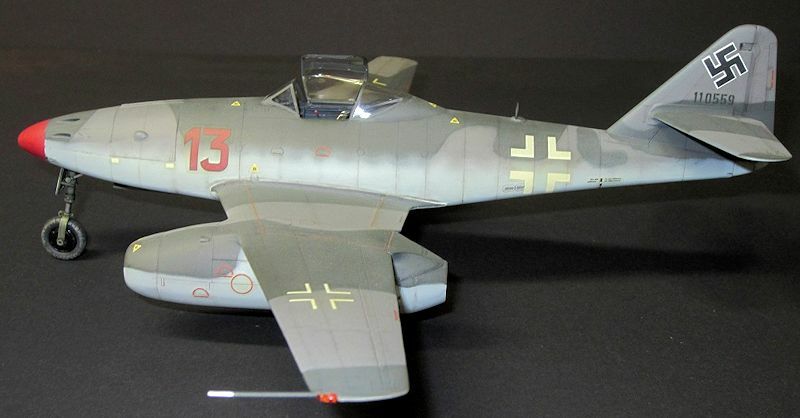 In fighter vs. fighter aerial combat the Me 262 was all but unstoppable, able to enter or break off the fight at will. New Allied tactics were adopted to counter the Me 262 threat. The jet bases were specifically targeted and bombed. Allied fighters would also “sit” over their bases and attack when the Me 262s were landing or taking off because the Me 262s took a long time to build up speed and to bleed it off again, making them extremely vulnerable in the “low & slow” stages of a mission. Ultimately, it was lack of fuel that grounded the Me 262s in the final stages of the war. This kit originated in the 1980s. Released by Trimaster it was one of the first “wonder kits” complete with photoetched details, vinyl tires, engraved detail and comprehensive decals. The price when released was extravagant, making it somewhat of a “Holy Grail” of models. 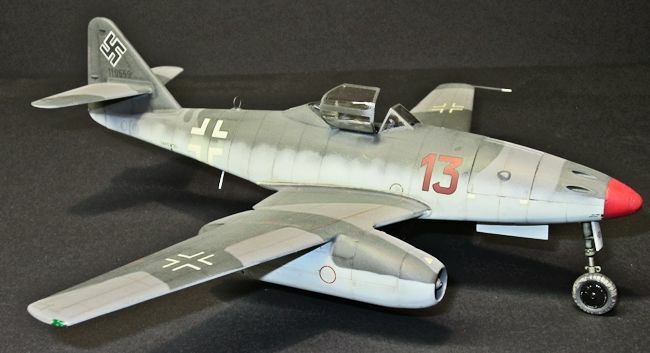 Dragon picked up the molds after Trimaster went belly up and released the Me 262 as one of their “Master Series” of kits in the early 1990s. How does it hold up today? The engraved detail is okay, but not as refined or extensive as that of an Eduard kit. There is minimal flash, and the clear pieces are of good quality. The photoetched details are thick. This thickness is good for antennas and structure, but difficult to work with on the small parts. The kit decals are thin, opaque and in register. Nicely appointed and detailed, the cockpit is really good. Vinyl tires are a nice touch. I acquired this kit as a part of a package deal on e-bay. It had been started by the previous owner who painted the interior RLM66. Unfortunately, the paint must have been oil-based or enamel, causing the Tenax 7R adhesive I use to not stick. More on this later. Per the usual, construction began with painting and detailing the cockpit. As mentioned earlier, the RLM 66 was already painted throughout. I brush painted the cockpit details and gave the interior a thin black wash. Once the wash had dried, I drybrushed the interior with a slightly lighter shade of gray. I added the photoetched seatbelt for the pilot’s seat. Because of the paint interacting with the Tenax, I had d ifficulty getting the interior bits to hold together. Perseverance prevailed and I closed up the fuselage. Though fit is not the best, the rest of the airframe built up without drama. Several sessions of adding putty, Mr. Surfacer and sanding followed. I did not realize it, but I should have cut off the gun blisters on the nose at this time. I caught this after painting the airframe and decided to let it go. As the final step in preparation for paint, I added the canopy. The kit canopy comes with a hinge allowing one to pose the canopy open or closed. I found it quite fiddly, and in the end, it doesn’t look great closed. If I were to build this kit again, I would delete the hinge and build the canopy either open or closed. The clear parts were dipped in Future prior to assembly. I used Tamiya tape to mask the clear parts. Oberstleutnant Heinz Bar was a jet ace with 16 “kills” to his credit while flying the Me 262. There are well circulated black & white photos of Bar’s “red 13”. There are also countless reviews showing it in late war camouflage of RLM82 and RLM83 over RLM84 (a late-war version of RLM76). While this may be the case, there is evidence that Bar’s plane was an early version and would have been painted in RLM74 & RLM75 over RLM76. Evidence includes: the airframe serial number (earlier aircraft), lack of pilots head armor (clearly visible in the photos), and lack of gun blisters on the nose. I chose to finish my Me 262 in the earlier camo scheme (it is a good looking bird either way). All paints used in this build were Polly Scale acrylics. RLM 66 was sprayed on the canopy framing first, followed by RLM 02 on the gear doors and landing gear. The RLM 74, 75, & 76 were added in several painting and masking sessions. At this point I used pastels to emphasize the panel lines and dirty the airframe up a bit. 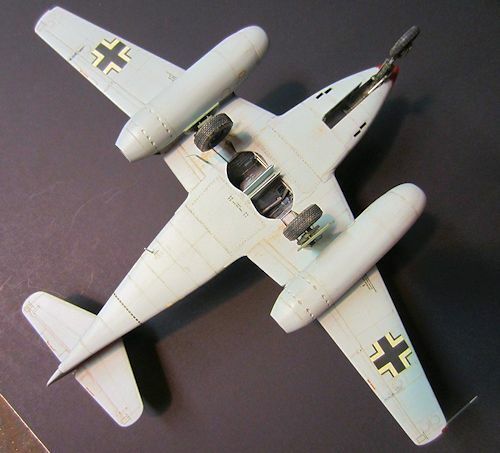 I added structural detail to the Me 262 using the pastels to highlight the underlying stringers, etc. I tried to keep things subtle, adding just enough to enhance detail. I used a reference book to locate the stringers, bulkheads, etc. I then sealed everything with a coat of Future in preparation for decals. I used the kit decals for this one with one problem. The kit decals carried a very thick adhesive residue. I had to press them down repeatedly to squeeze the adhesive out. Several of the decals “walked” after they were in place and had to be repositioned and re-squeezed. This is probably due to the age of the kit more than anything else. Once firmly in position, the decals responded well to an application of Micro Sol. I was fortunate to have a good photo of the plane I modeled. The markings are correct and in register. After weathering the decals, I gave the plane a final flat clear coat. The landing gear and other final bits were added at this time. Final detailing was then completed. There are many reviews of the Dragon/Trimaster Me 262 out there. Most agree that it is still a good kit that turns out nicely. There are two areas where this kit falls a bit short of current off erings. When compared to Tamiya and Hobby Boss Me 262s, the finesse/amount of the engraved detail and the fit of some parts in the Dragon kit is a bit crude. Though it looked a little rough in the box, I’m impressed with the end result. The airframe builds up relatively easily, the photoetched structural parts are straightforward to install, and the level of detail they add is really nice. The clear parts are okay and the decals work well. Due to the multimedia nature of the kit, the higher parts count, and the sometimes fiddly construction, I would recommend the Dragon Me 262 for those modelers with some model building experience.